"The award is dedicated to the women of Baduria, who fight a daily battle against unnamed, hidden and silent odds. Nabanna is a movement and there are still miles to go to reach our goal. This recognition brings our project under global spotlight, which is very important. The award has brought great joy to my team members who have worked unfailingly against major obstacles to take the project where it is today. The award acknowledges the importance of research in project work. It also highlights the importance of off-line dissemination strategies for ICT projects. More importantly, it makes it clear that an ICT project can be successful provided it takes an approach that links its progress to the needs of the local community." 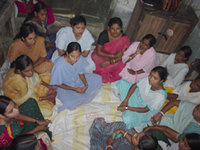 In 2002, concerned over the lack of penetration of ICTs among the rural poor, Change Initiatives found that absence of information and a information sharing mechanism among poor women have thwarted their ability to fulfil basic needs, restricted their awareness and blocked their desire to mobilise to break barriers that limit their participation in society. Change Initiatives is putting a web-based information system to strategic use for the benefit of poor women of Baduria, a rural region in North-24 Parganas district in the Indian state of West Bengal. The project, Nabanna, is a collaboration exercise among Change Initiatives, UNESCO, National Informatics Centre, researchers of London School of Economics and Queensland University of Technology and the Baduria Municipality.